Should I take supplements while I’m on the program? 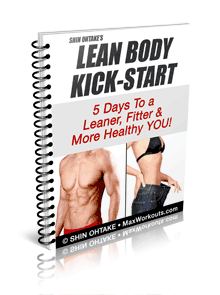 Your MAX Workouts purchase comes with a free copy of my nutrition book, The Lean Body Diet. Inside you’ll discover how to eat for maximum fat-loss through healthy, whole foods without the need for supplementation. Whether you’re trying to lose weight, build muscle, or just clean up your diet, this book will take the complexity out of dieting and show you the easiest, most effective ways to get lean fast. That said, I understand that life happens and you can’t always eat all the foods that I recommend 100% of the time. To make sure you get your daily macronutrient needs, there are a few select supplements I recommend to support increased fat-loss and optimal health. Of course, I only recommend supplements that I take myself—I’m very picky about which companies to trust and I only recommend products that use all-natural ingredients. Remember, health and wellness simply doesn’t come in a bottle. So if you’re looking for a “quick fix” without any effort, MAX Workouts probably isn’t for you. I created the program for people who enjoy working out and want to take their fitness and fat-loss to the next level while saving time by working out and eating smarter.